From left to right: Kayden Leach, Nathalie Young and Remington Graffice operate The Winner’s Circle Friday morning at Hayes High School. Job Coach Ronda Threlfall said running the store helps the students gain business, social and customer service skills. Pictured is some of the clothing available at The Winner’s Circle. Delaware Hayes High School Principal Dr. Richard Stranges said the clothes are made by Make It Yours, a local business, and are sold to the school at or barely above cost. 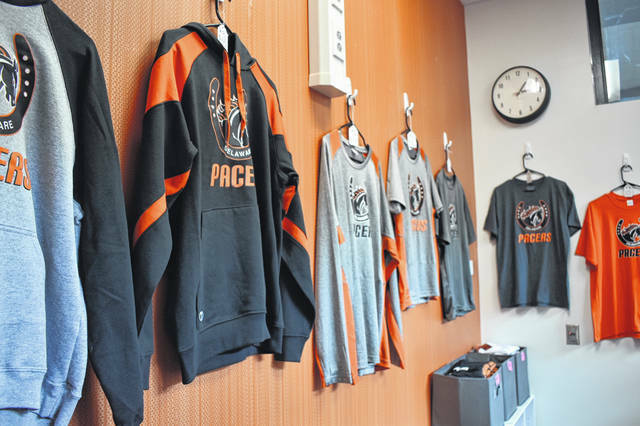 Hayes High School students have a new option to purchase Pacer gear or snacks between classes — The Winner’s Circle — a new store located inside the school. Hayes Principal Dr. Richard Stranges said Friday that The Winner’s Circle opened on Thursday and offers Pacer clothing and merchandise like keychains, as well as a few snacks. The Winner’s Circle, named to honor The Little Brown Jug according to Stranges, is open between 11 a.m. and noon, and it is staffed entirely by special needs students who are overseen by Job Coach Ronda Threlfall and other staff. “We used to just have a cart in the lunchroom,” Threlfall laughed. Stranges said the clothing items in the store are made by Make It Yours, a local business, and are sold to the school at or just above cost. Threlfall said operating the store is part of the special needs unit’s job training program, where special needs students go to various job sites like the YMCA or Delaware County Fairgrounds and learn skills. The store is located just inside the entrance of Hayes in one of the main walkways, which Threlfall said helps train the students’ social skills. The students themselves said they enjoy the job. Sophomore Kayden Leach said his favorite part of working the store is handling money and giving people their items. “It’s a great opportunity for (special needs) students, and a great opportunity for students in the building to be able to purchase clothing without having to go all the way out to Meijer or Walmart,” Threlfall said. Stranges said he’s glad the Winner’s Circle is in the front of the school. https://www.delgazette.com/wp-content/uploads/sites/40/2018/09/web1_DSC_0351.jpgFrom left to right: Kayden Leach, Nathalie Young and Remington Graffice operate The Winner’s Circle Friday morning at Hayes High School. Job Coach Ronda Threlfall said running the store helps the students gain business, social and customer service skills. https://www.delgazette.com/wp-content/uploads/sites/40/2018/09/web1_DSC_0359.jpgPictured is some of the clothing available at The Winner’s Circle. Delaware Hayes High School Principal Dr. Richard Stranges said the clothes are made by Make It Yours, a local business, and are sold to the school at or barely above cost.